voltarea has no other items for sale. 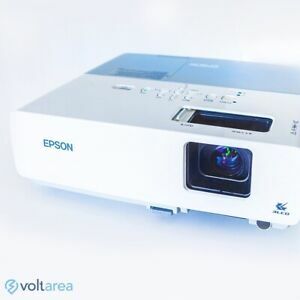 Deliver attractive presentations to your students with the Epson PowerLite 83+ LCD Projector. This projector provides bright and attractive images with 2200 lumens color, 2200 lumens white-light, and the Epson 3D technology. Built-in 10-watt speakers produce rich audio loud enough to fill most rooms, and the closed captioning functionality fully accommodates the needs of the hearing impaired. In addition, the LCD projector has a 1.2x zoom ratio that offers you positioning flexibility, while an energy-efficient lamp that lasts up to 4,000 hours makes your images bright. The RJ-45 feature makes it possible for you to monitor the project in a network, which saves you time. For stability, the projector is secured with an anchor bar. The seller refuses to honor their listing of a working Epson remote,misleading! My projector and everything came in great shape! Arrived super fast, thanks! A++++++++++ 5 Stars! A+ supper fast shipping. Thank you! My house, a movie house. It has good sound, decent image. There is no hdmi input, but other methods are ok. Power cord gets suspiciously warm or hot. I think original cord was thicker, less hot. Nice projector. The powerful epson 83+ runs cooler than most projecters casting a more than 200 inch display and supplies a multitude of connections for nearly any device. The detail in the images are habit forming and the most amazing part is that a five pound bag of sugar is heavier than this projector. Epson knocked this one out of the county! I have had over a dozen of these and similar epson projectors. It passes the gold color standard and the screen door effect better than any other projector I have tried. the others did not come close to the quality, ease of use and reliability of the Epson brand. Also the low cost replacement lamps make this the best deal on the market. I have averaged about twenty thousand hours on each. I wrote a review on this already. This is the one advertised as the powerlite 83+ but is actually the EMP 83H. As prev. stated, they are the same thing. The unit arrived early and in great shape. Everything works well. I now have 3 of these (2 83H units and a EMP1715) and a Sharp 212X and a DBPOWER T20. All of which are overkill for Halloween effects for our annual party. These are a bargain at $50-60 compared to new Chinese projectors. Parts a cheap for the Epsons and Sharp. filters,bulbs ect.